Creator: William C. Ellington, Jr. 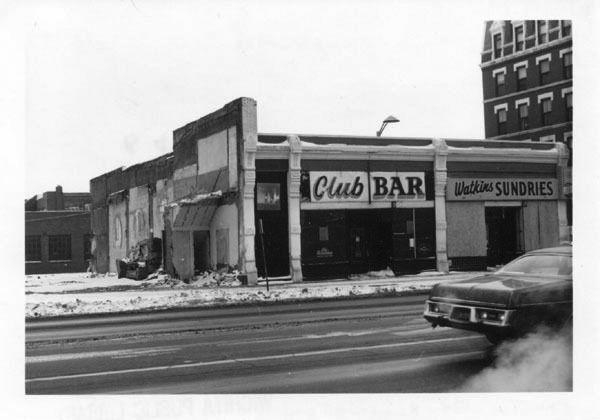 Description: Club Bar and Watkins Sundries buildings on the south side of Douglas Avenue at St. Francis prior to being torn down. Keywords: Wichita, business and industry, street scenes, Club Bar, Watkins Sundries, Eaton Hotel, Skid Row, Douglas Avenue. Description: Bank drive-thru located at southwest corner of 21st Street and Amidon. 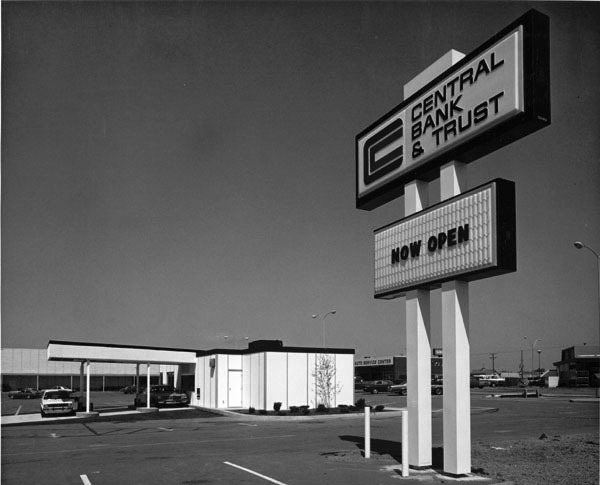 Keywords: Wichita, business and industry, banks, buildings. Description: Bank vice-president Dale E. Wallace, left, and Wichita mayor Tony Casado, right, watch as bank president V. Eugene Payer cuts ribbon at grand opening of National Bank of Wichita branch at 8971 West Central near southeast corner of Tyler Road and Central Avenue. Covered wagon and Cadillac at drive-up facility. Duckwall's and Four Seasons Dry Cleaners stores in background. Keywords: Wichita, business and industry, people, West Wichita.